November 9th,11 AM - 2 PM - North County Philanthropy Council's Annual Volunteer Awards, celebrating North County's best. November 14th, 8:30 AM - 1 PM - Military Connected Nonprofit Symposium. 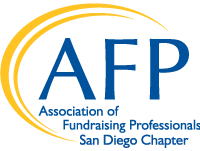 Discuss the state of philanthropy & its impact on military/veteran communities. November 14th, 11 AM - 12 PM - You and the Future of Doing Good. Learn from Trista Harris, whose philanthropic work has been covered by national publications & featured on CNN. November 15th, 9 AM - 10:30 AM - Donor Prospecting For Greater Giving. Learn successful strategies & techniques to identify and cultivate donors.